One of Rome’s most compelling and accessible historic sites is also one of its most underrated. Ostia Antica, Rome’s ancient port city, is full of ruins and monuments, some in even better condition than the famous Pompeii and easily accessible from the center of Rome. If you search, "most photogenic towns in Umbria", Spello comes up in the top ten. For such a small town, there's definitely a big group of people on the Internet who love it and extol its virtues. While taking a weekend trip in the region of Umbria, I fit Spello into an afternoon, after seeing Assisi. You could also do a day trip to Spello, from Rome, which is easier by car, and possible by train. If you're heading out to the campagna, Spello should be on the top of your list of things to see in Umbria. Whereas other cities in the region of Umbria have many sights to see, including major cathedrals, museums, and shops, Spello is a small town on top of a mountain. 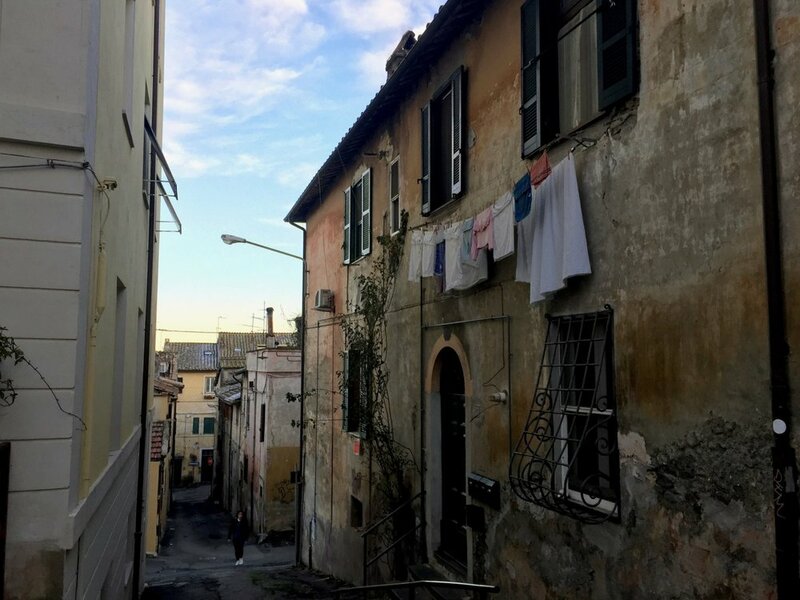 Its location makes it very picturesque and fantastic for anyone interested in photography or seeing small-town Italian life. It's also in the region of Perugia, which like all of Umbria, has amazing wines. There are tons of small beer and wine shops along the tiny streets, with outdoor seating and fresh, farm-t0-table food. There's really not much to dislike about this town, but it is very quiet and relaxed, so maybe not suitable for an entire weekend trip. As a stop along a larger Umbrian tour, I found it a perfect resting point and spot to eat a delicious lunch before driving back to Rome. Like most things in Italy, getting to Spello by car is probably the easiest way. In an hour and 45 minutes, you'll be at the top of the mountain and can park outside of the city walls. From there, walking is necessary and enjoyable. If you can't rent a car or find a friend who has one, there's also an express train from Termini Station in the center of Rome to Foligno, that takes about two hours. From Foligno, you can easily take a 5 minute local train to Spello or call a cab for the 15 minute drive. Spello is a town that deserves to be taken slowly, by enjoying glasses of wine outside and long walks through the center. It's all on a hill so you definitely get your exercise for the day walking around, but the views are worth it. I took some small side roads to see what else there was besides the main road (where most of the restaurants are located). There's also a path all the way up to the top of the mountain where most tourists go for the amazing panoramic view. When ordering wine, definitely ask your waiter for recommendations. They have some amazing locally-produced wine in Spello that you can't find anywhere else in Italy. The reds are particularly good and local, which is what we went for. There you have it— why this tiny, but surprisingly well-known town became one of my favorites in Umbria. Spello's great for a day trip or a weekend getaway. I love the entire region because I think it really has it all. Beautiful scenery, super friendly people, historic towns and truly some of the best food I've had in this country. I've also written a weekend guide to Umbria and a post about one of my favorite cities in the region, Urbino. I'd be interested to know, do you prefer smaller towns like this, or the heavy-hitters like Rome, Florence and Venice? Finding a nice day trip from Rome that is accessible, easy to get to, and worth the extensive public transportation travel time, is sometimes difficult for visitors. A day trip from Rome to Castel Gandolfo covers all the bases. Primarily known as the Pope’s summer residence, Castel Gandolfo is a small village that overlooks gorgeous Lake Albano that's surrounded by Lazio’s mountains. The lake itself is a nice day trip itself in the summer with beaches, boats or bikes for rent and the classic Italian waterfront atmosphere, but even in the winter it makes for a great visit. Tickets for the quick regional train from Rome are €2.75 each way and can be bought at Termini Station in Rome and validated on the platform in Castel Gandolfo. You also get the added benefit of a scenic train ride through the Italian countryside for less than the price of an American coffee. You can sightsee in the village, with a trip to the Pope’s castle, a walk through the charming village and of course, a long lunch in one of its delicious trattorias. We headed up there for Sunday lunch and a trip to a local mercatino. Even in the winter, the town was alive with tourists, locals, fresh food markets, small boutiques and many restaurants. The lunch itself was incredible and a great reminder of how amazing food in the country can be. After checking reviews, we went to Arte e Vino. The food there was typical Lazio, hearty and delicious. We got wine, an an appetizer, and two pastas for around €35 and everything was top notch. I would’ve grabbed one of their amazing desserts if I had had room by the end of the meal. If I’m eating in the country, the one thing I will always order (besides the house wine) is a plate of meats and cheeses. They’re always so fresh and as a prime example, Arte e Vino’s mortadella drizzled with truffle oil was the best mortadella I’ve had in Italy. I actually wanted to cancel my primo and get a second round of mortadella after finishing up the first plate. It was that good. My pasta con ceci (chickpeas) in a sourdough bread bowl was a close runner-up, however, and filled my mortadella void. The only issue we had with Arte e Vino was the very slow service, but this sometimes happens during Sunday lunch at one of the most popular restaurants in town. Castel Gandolfo makes for a great day trip from Rome. The tasty food, amazing views, and ease of transport make it one of my highly recommended choices. I can’t wait to go back for a seafood lunch and a boat ride on the lake once it gets warmer out. If you want more information about making a longer trip out of it or renting a car to explore the area, try this Trip Advisor post. 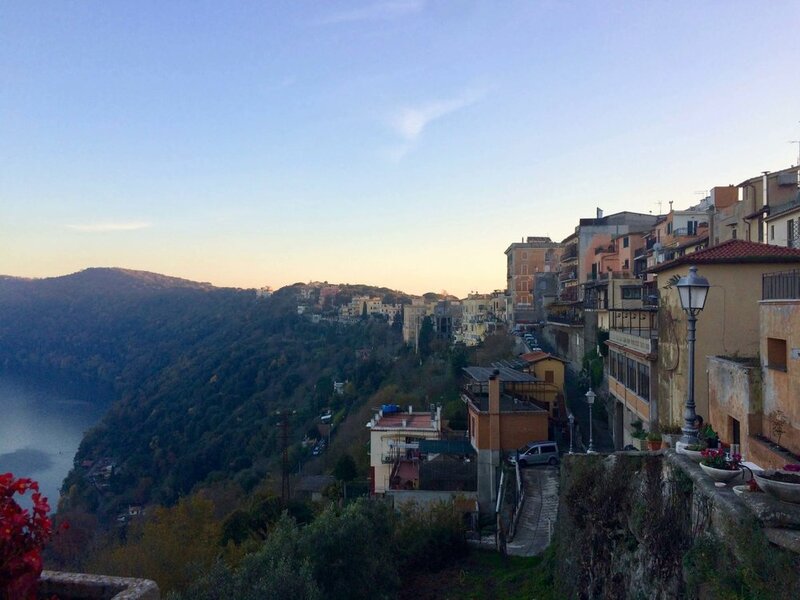 And take a look at Natalie of An American in Rome’s post about Castel Gandolfo here. 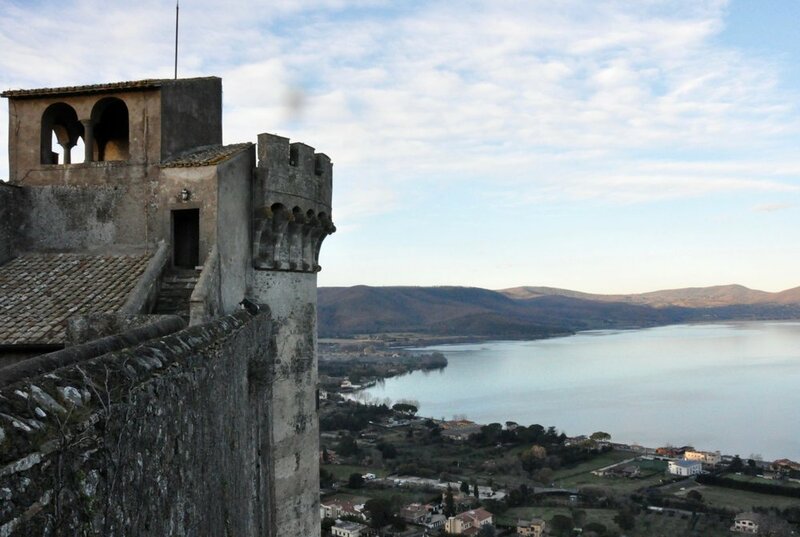 Lake Bracciano is a Roman secret that not many tourists know about. Set in an absolutely beautiful location in the Lazio countryside, the lake is only a 40 minute drive from Rome. Especially during the hot summer months, Bracciano becomes the perfect getaway to escape the heat and crowds in the city. The lake is big enough to support boating, fishing, and swimming, while the surrounding coast is full of delicious seafood restaurants and bars. Just up a hill, the medieval town of Bracciano overlooks the view of the lake and is the perfect smaller town to explore for the day. I went last weekend in January and the town itself was enough fun to keep us occupied. 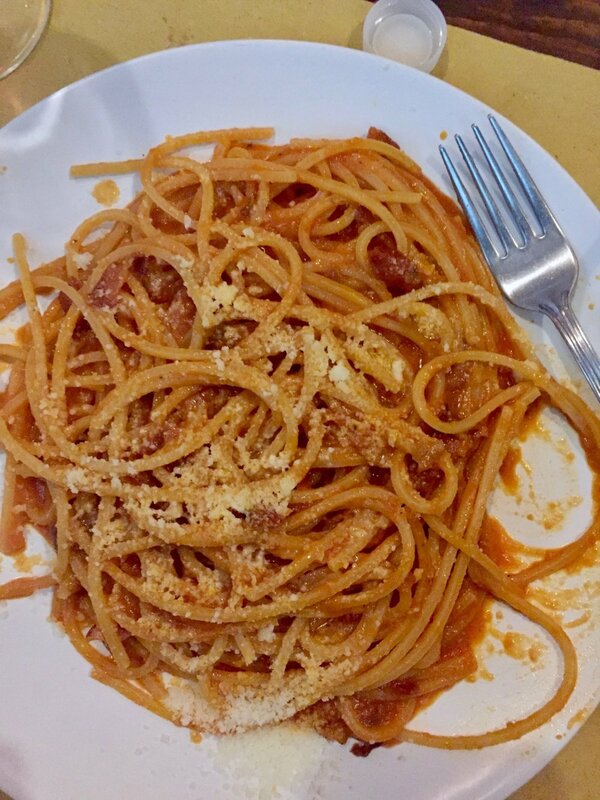 The real draw to Bracciano is its many restaurants and delicous, cheap food. Anything outside of the city is much less expensive and with fresh food prepared daily, taken from nearby farms, the quality is incredible. We went to a small trattoria run by a couple and tried all of the standard Roman pasta dishes like Matriciana, Cacio e Pepe, and Carbonara. Alongside our €10 bottle of wine and a salame/prosuitto plate, it was the perfect meal. In Bracciano, both meat and fish are available, the first coming from the regions surrounding Rome while the latter might be directly from the lake. Aside from incredible dining opportunities, this small hillside towns offers small boutiques for shopping, cafes to sit and relax, and a historic points if you’re interested in learning more about its past. For the first time, I checked out the huge fortress that Bracciano surrounds and went inside to see its interior. It’s incredible well-preserved with furniture from the 15th and 16th centuries, original frescoes, Renaissance paintings, and a great buttress walk to see the view from the top, which was obviously my favorite part. Aside from seeing how the ancient Italians lived, you’re able to fully appreciate the town’s beauty when seeing it from its highest point. 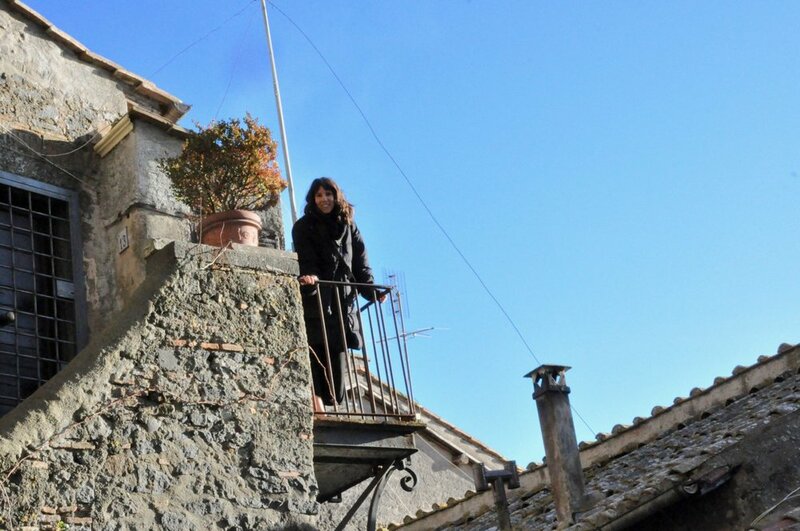 For a quick day trip in off season, Bracciano is perfect. If you’re willing to deal with some competition, but still less crowds than in Rome, a visit to the lake in the summer is fantastic. Whichever way you go, a trip to Bracciano is worth your while.